FormUpright, spreading, and notably bushy growth habit. Zones 7-8 Estimated 450-500 chilling hours. FoliageMedium green foliage, topside of leaf is green, underside yellow, turning glossy-reddish in the Fall. FruitUniformly large sky-blue berries with excellent flavor and a very pronounced "tropical fruit" aroma. 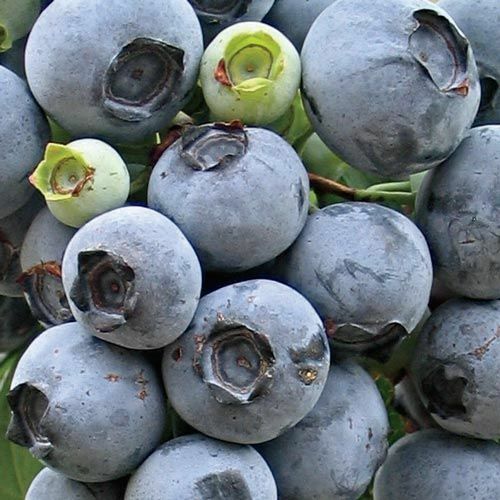 CommentsSouthern Highbush blueberries are a heat-tolerant cross between Rabbiteye and Northern Highbush varieties, combining Rabbiteye heat tolerance and "Southern Toughness" with a better fruit quality of a Northern Highbush. YieldMedium, averaging 4.5 to 5 lbs per plant each year for 3 to 4 year old plants grown in bark beds with irrigation. Days To MaturityFruit development period 64 to 69 days.